From theory to praxis: thanks to the cooperation between Maccaferri Industrial Group and RadiciGroup Performance Plastics, a new method for the production of sustainable steel wires will soon be available to the building sector. 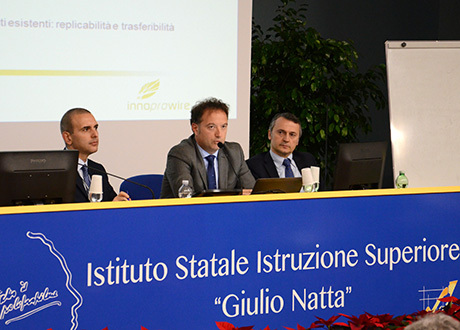 A training day dedicated to LIFE-Inno.Pro.Wire (http://www.lifeinnoprowire.eu/), in order to review the current progress of the project, funded by the European Union and stemming from a partnership between Maccaferri Industrial Group (through its companies Officine Maccaferri SpA and SAMP SpA) and RadiciGroup (through Radici Novacips SpA, headquarters of the Performance Plastics business area). We remember again that this is a challenge which aims to design an innovative process with a lower environmental impact, for producing extruded steel wires to be used for the realisation of metal net protection and containment structures. The sustainability aspect of the project is the use of polyamide-based polymers as a viable alternative to PVC for coating steel wires. The workshop, organised by Maccaferri and RadiciGroup at the Istituto Chimico Natta in Bergamo, saw the participation, as well as of the students, of Giuseppe Riva, director of Plastics Europe Italy, of Ruggero Targhetta, President of EURIS srl, and of Gioia Garavini of Ecoinnovazione srl. The LIFE-Inno.Pro.Wire project represents a perfect synthesis for students and a concrete application of what they learnt during this course: a complex planning, the development of a material and of a specific process technology based on the application critical issues, and a European method for the environmental enhancement of the manufactured product. It is also an opportunity to increase the positive role carried out by Europe in terms of orientation towards a more environmentally attentive society (circular economy) and financial support for innovation projects (European funds).